66 Comments This post may contain paid and/or affiliate links. Please see our disclosure policy for further information. Leaving the security of a steady paying job to launch a new business can be a scary endeavor. Even if you've planned and saved six months worth of living expenses, often it takes months to start generating income from your business. Even if you don't have money coming in, your business still incurs expenses to run smoothly. But don’t despair, there are tons of free tools, resources, guides, and printables, so you don't have to break the bank. Here's a massive list of free business resources so you can focus on making money instead of spending it. Since you won't have a brick-and-mortar location, the heart of your home-based business is your website. Having a site allows people to window shop your services and products, it helps them find you via the web, and it conveys valuable information. Personally, I think it's in your best interest to own your website (purchase your domain name and hosting), but if you can't afford a website right off the bat, I suggest using a free option until you can afford to switch to a more robust platform. A few things to note about free platforms. Usually, you're limited to a small number of web pages, you'll have limited bandwidth and storage, and often you'll have a sub-domain. If you can spare $2.95 a month, I highly recommend setting up your own website with WordPress. Not only is it affordable, but it's also extremely simple to set up and use, and it will give you a professional looking website. 2. Free Online Productivity Tools. You'd think as much as I'm online, that I'd rely heavily on online productivity tools, but I don't. As you'll see below, I like to use real-world tools to help me stay organized. But if you prefer online time management tools – here's a great list to keep you on track. I'm old school when it comes to planning and organizing. For all of my personal and business activities, I use a physical planner, calendar, notebook, and tons of printables. From grocery lists and daily to-dos to packing lists, chore charts, and business goals. If you're looking for free printables to organize your business and life this list has you covered. When I first started my business, I used a spreadsheet for all of my income and expenses. Not only has the process manually intensive, by it made tax-time a nightmare. Save yourself the frustration and use a professional platform. The resources listed below offer invoicing, budgeting, planning, bookkeeping, and accounting solutions. When you're running a business, you'll find yourself searching for all types of forms and templates that you don't even know you need until a particular situation arises. When the time comes, here are some great resources to have bookmarked. 6. Free Content and Project Management Systems. When you're a service provider (virtual assistant, freelance writer, graphic designer, etc. ), you're going to have multiple projects and clients to manage. The best way to stay on top of everything is by using a content or project management system to keep you organized. 7. Free Marketing Tools and Platforms. It's been said that you should spend at least 20% of your time marketing your business. With hundreds of ways to market your business, you should be able to find a formula that works for you. Here are a few free platforms and resources worth checking out. You may already have Microsoft Office on your computer, but if you don't, the yearly subscription can be pricey. Here are some other options that work great and they're free. It's funny when you work in an office setting you don't even think about all the different methods you use daily to communicate with others – the technology and systems are already in place. However, when you run your own business, you'll quickly learn that you need a whole host of tools. Luckily, there are lots of free and reliable options. 10. Free Design Tools and Stock Images. As an entrepreneur, you'll take on many roles. Quite frequently that role is a graphic designer. But no worries, you don't need any special training to create professional-looking images, presentations, and marketing materials; these tools are both free and easy to use. 11. Free Tools and Resources for Bloggers. If you run a blog, there's no doubt that you'll need some specialized tools to make your blogging efforts easier. Here are some that I use and recommend. Are you ready to make money from home this year, but you're not sure what direction to take? Here are a bunch of FREE online courses that can help take the guesswork out of what work-at-home career path you should take. One last note about business freebies. There will come the point where your time becomes more valuable than saving a few bucks. So as you grow, invest in the proper tools that will ultimately save you time and money; as freebies often have limitations. 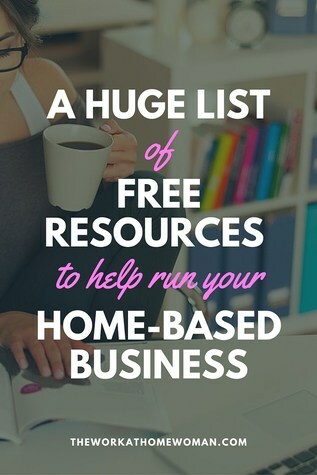 Do you have a free resource or business tool that you can't live without? Drop us a note below, we'd love to hear what you're using. Originally published November 25, 2009. Content updated February 27, 2018. This page includes affiliate links. Please be aware we only promote advertising from companies we feel we can legitimately recommend to our readers. Please see our disclosure policy for further information. Hi, this is very detailed and very helpfull list. Thanx for sharing. thanks for sharing all of this stuf.. very usefull.. Here are a couple more I have come across lately. Mint.com – a free money management/budgeting site. Super robust. Animoto.com – a free video production site. Upload your raw video footage and produce a polished video complete with transitions, labels and music. Easy to use. Very cool. Thank you for listing Mikogo. If you would like to join us on LinkedIn to discuss Mikogo and desktop sharing, please feel free to join us. Thanks! lettermelater.com Schedule emails to go out in advance! GotFreeFax.com also allows user to send free fax online to the US and Canada. User can either upload a PDF/Word file or enter text to fax. Plus, it does NOT add Ads to user’s fax and is suitable for faxing formal documents.